Spring break is here and the weather forecast is looking wet, wet, and wet. Resist the temptation to stay at home and get out and enjoy some fun family activities. There are expanded hours and special events planned that will make everyone happy, from the bookworms to the bundles of energy. Put up the bumper rails and borrow the ball ramp; even toddlers can join in some bowling fun at Petaluma’s Boulevard Lanes. This AMF facility has 40 lanes, a café and a pro shop. Join their email list when you visit and receive regular discounts. They will come in handy when summer break hits in a couple of months! Commune with the Charlie Brown and Snoopy at the Charles Schulz Museum in Santa Rosa. This charming museum brings to life the wonderful Peanuts characters with exhibits that will amuse adults and interactive areas that will entertain the kids. Visit on Museum Mondays for Little Ones (next one on March 28th, 10am – noon) when extra activities are set up to keep your 1-5 year olds busy. Food and snacks are available at the Warm Puppy Café in the Snoopy Home Ice next door. Enjoy some winter fun at the festive Snoopy’s Home Ice. You don’t have be an experienced skater to enjoy the alpine atmosphere at this ice arena. Built by Charles Schulz in 1969, it features Swiss chalet facades and panoramic scenes from the Alps. There are public skate times almost every day (pending special events). For kids 11 and under they offer a drop-in Parents and Puppies Practice with instruction (Sunday mornings, 10:30 – noon). Food and snacks available at the Warm Puppy Café. Check the website or call for the latest schedule. 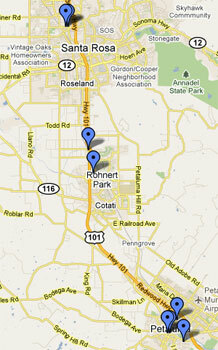 Put on a pair of good ol’ roller skates or break out some “blades” and head to Cal Skate in Rohnert Park. Kids 10 and under can bring their parents and get some skating instruction at the Tiny Tots Morning Skate (Mondays & Thursdays, 9:30-11:30am). They have an expanded spring break schedule between March 21st and March 25th. Check the website or call for the latest udpates. Encourage reading! Browse some books at the local bookstore or library while your kids listen to stories or join in some crafty activities. A Likely Story has story readings or story telling every Sunday from noon to 1pm. The Petaluma Library has story times during the week for children of different ages and has added some special activities for the week of spring break. Learn about local aviation history at the Petaluma Historical Museum exhibit, “Flight” – A Tribute to Aviation. With video footage, model airplanes, and a very large replica of Fred Wiseman’s airplane dangling beneath the dome this exhibit is the perfect size to engage and educate without demanding too much attention from younger visitors. Tap into your inner speed demon and give your kids an early driving lesson at Driven Raceway in Rohnert Park. Kids must be 48” tall to operate the karts. They also offer black light mini-golf, alley trax mini-bowling, and arcade games. Check their website for details and specials. a great idea for spring break cpuld be having a indoor camping trip.put up a tent and and eat camping food.you ca]n tell scary stories and roast marshmellows over the stove or even take a hike around the house.